Chairman of the Northwest Band of Shoshone Darren Parry address the crowd assembled at the Bear River Massacre site Tuesday morning. It was as big day Tuesday for the Shoshone Northwest Band of the Shoshone Nation. For the first time anyone can remember an Idaho state official showed. 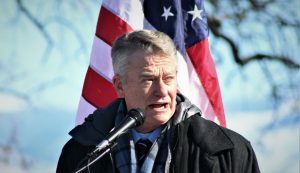 Governor Brad Little attended, spoke and signed a proclamation recognizing the significance of the event and location. Idaho Governor Brad Little signs a proclamation recognizing January 29 as the Day of Remembrance for the Bear River Massacre. On a bitterly cold morning of January 29, 1863, Col. Patrick Edward Conner and about 200 California volunteers attacked the winter camp of the Northwest Shoshone in the area near Preston along the Bear River. More than 300 men, women and children were killed, homes were burned, supplies and horses were stolen. The Bear River Massacre was the single greatest loss of Indian lives in American History. 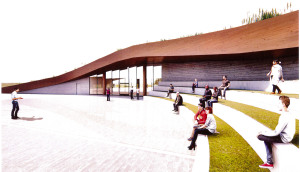 A rendition of the Bear River Massacre Interpretive Center to be built on newly purchased land by the Northwest Band of Shoshone. Chairman of the Northwest Band Tribal Council Darren Parry conducted the meeting and addressed the group. He reminded them of the progress they have made buying the property in and around the massacre site. Since then, the tribe has continued to buy property used by their ancestors for generations to gather during the cold of winter. 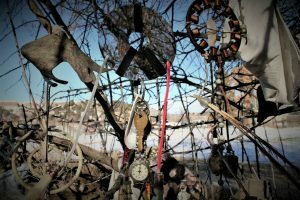 Dream catchers and other memorabilia hang in a tree near the memorial ceremony for victims of the Bear River Massacre Tuesday, Jan. 29, 2019. He also introduced his plans for a future Interpretive Center and marked the spot where it is going to be built by erecting his personal tepee. 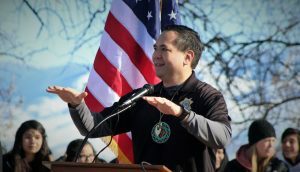 Utah’s Attorney General Sean Reyes also spoke of the importance of remembering the past and how he, as a Hawaiian, is also a Native American so he related to some of the same struggles. 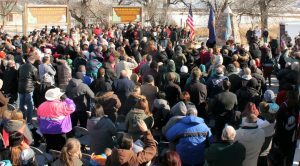 Utah Attorney General Sean Reyes spoke to people gathered to remember the Northwest Band of Shoshone who died during the 1863 massacre. He was impressed with the number of people that showed to show their support of the people that had gone before. He called them the First Nation brothers and sisters. A crowd of over 300 people stand and salute the American Flag as part of the Bear River Massacre Memorial on Tuesday, Jan. 29, 2019. He told those in attendance to take a moment to look around and he promised them there are spirits gathered in multitudes all around them. Reyes said he thought it was important that the Shoshone language be remembered. He said there was a time in Hawaii their language and culture was being lost but there was a movement to keep it alive. He thought that it was important for the Shoshone to do the same. Lanny Thom, the final speaker at the Bear River Massacre Memorial, spoke in the Shoshone language and then read in English some tribal members that passed during the massacre. The final speaker was Lanny Thom who read names of some tribal members who passed during the massacre. The names came from records from the Church of Jesus Christ of Latter-day Saints Logan Temple, names that Chief Sagwich had done temple work for early on. 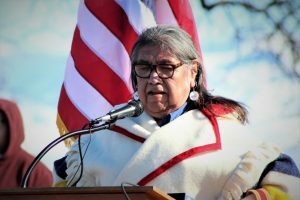 Patty Timbimboo-Madsen, the cultural resource manager for the Northwest Band of the Shoshone Nation, said she thought the memorial was a nice tribute to their ancestors.